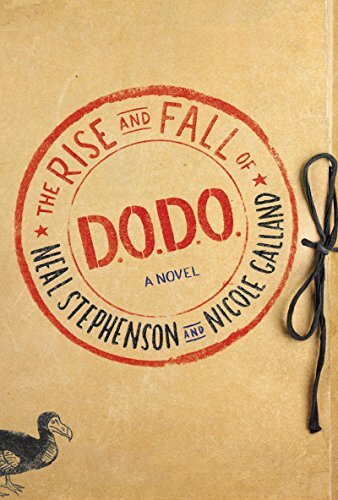 Just finished Neal Stephenson and Nicole Galland's The Rise and Fall of D.O.D.O. and it is a terrific read. For those of you who know Neal Stephenson (The Diamond Age, Cryptonomicon, Anathem, and Seveneves), you'll probably be a little disappointed because gone are the multiple 25-page infodumps endemic to his later works (most notably the turgid Seveneves). D.O.D.O. has been tempered with Galland's breezier style where the infodumps have been replaced by a relentless skewering of government agencies, bureaucracies, and their attachment to Powerpoint (among other technological quirks). For those who haven't read Stephenson, it's a little far afield from the Stephenson "infodump" style which is good, but bad if you read this then try some of his recent books. For newcomers, I would start with Zodiac and The Diamond age--more traditional book lengths--and maybe then try the long and denser Cryptonomicon, which is still highly enjoyable but foreshadows the infodump phase of his career. D.O.D.O. at its heart is a time travel story and a wild one at that. It's reminiscent of Connie Willis's time-travel novels Doomsday Book and To Say Nothing of the Dog, with a dash of Charles Stross's Merchant Princes series thrown in. I have always been a fan of Stephenson's snarky prose and here, with Galland's able assistance, snark bursts from every page and it is uproariously funny. The main narrator, Dr. Melisande Stokes, a Harvard lecturer in dead languages and cultures, could be a cousin of Titus Dragonmaster in the way she tells most of the story from her viewpoint. Needless to say, I enjoyed it immensely and enjoyed her narration immensely as well. It's a long book--740 pages--but it flies by; I read it in three days. Highly recommended.